Traction – Front to back, the herringbone worked perfectly fine. Dust and debris will slightly hinder overall performance of the traction – due to the translucent rubber – but if you are able to keep up with consistent wiping you should be alright. I stated this in the 1st Performance Teaser; the heel gave me some slight slippage when in transition. Mostly when curling around screens, running fast breaks & driving by the opposing player at an angle. It’s something that even I couldn’t change… couldn’t quite adapt to the issue very well so I wish there would have been less smooth surface along the heel and more herringbone to possibly prevent the issue from occurring too often. 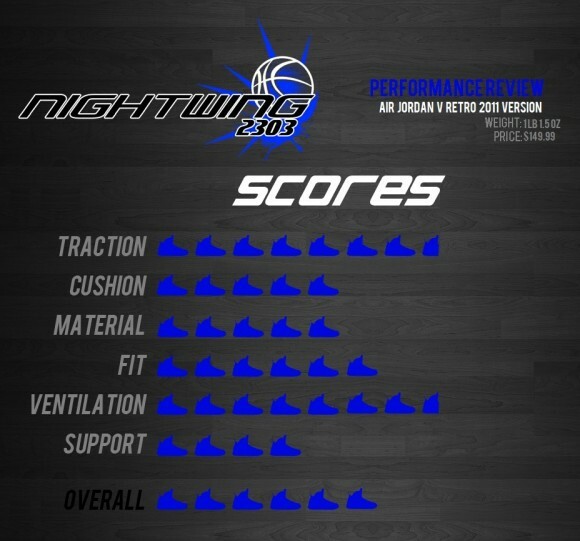 Cushion – Pretty much the same setup as the Air Jordan III & IV; featuring a heel & forefoot Air unit along with a Polyurethane midsole. The midsole will start off fairly stiff but soon breaks in over time, something that I had not experienced with the AJIII or IV. Forefoot cushion – while available – is lower to the ground so if you aren’t used to playing in sneakers that have you sitting roughly an inch above ground then you will want to give yourself time to adjust. 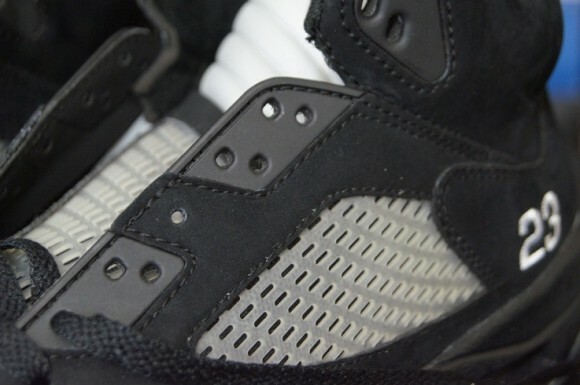 Material – Materials on this colorway require practically no break-in time. However, they get softer as you play so it’s less supportive as time goes by. If you choose to play in a pair I’d recommend wearing a pair with the split grain leather uppers as they’ll offer up much more durability & support. Fit – The fit was a hit and miss in most areas. While the midfoot fit is fine – also offers two ways to lace up your shoes for greater midfoot lock down if needed – the heel and forefoot are a bit sloppy… mainly the forefoot. Even going down ½ size you will receive a sloppy forefoot fit but the heel may improve a bit with less room from front to back. With a sloppy fit comes slight hesitation upon your movements and that can cost you a few milliseconds… which counts when you have your opponent beat yet you lose your advantage due to an interior forefoot issue such as slipping. 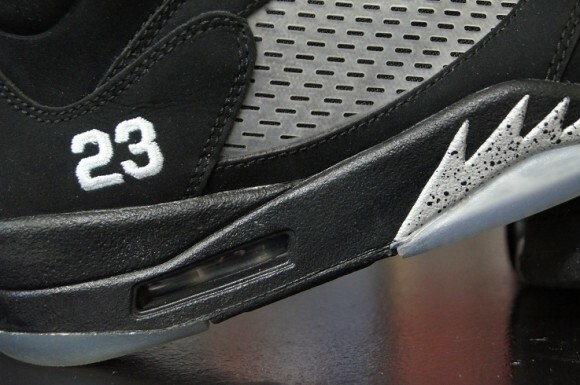 Ventilation – Much like the Air Jordan IV, the Air Jordan V offers ventilation on both side panels & tongue. 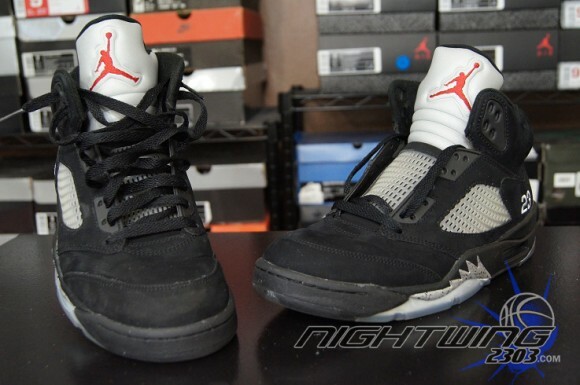 While the rubber mesh layered on top will slightly restrict air flow, it’s not horrible and shouldn’t be too big of an issue… especially seeing as how most performance models in this era lacked ventilation so in comparison the Air Jordan V was probably one of the most well ventilated shoes at the time. 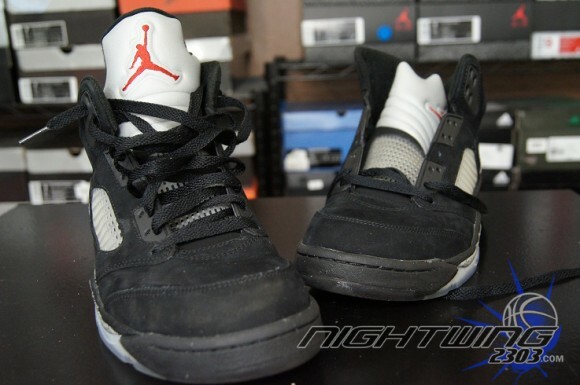 Support – Again, just like the past Air Jordan models, there isn’t much support. There is a molded arch and a thin internal heel counter – what it’s made of I do not know – so that’s pretty much all the support you will get. If the upper features leather versus the nubuck you will receive a bit more support from a material standpoint than you would from this particular pair. Overall – Still a great shoe from its time. Not a complete upgrade from the Air Jordan IV – in my opinion – but they were headed in the right direction going into the 90’s. If you were to play in a pair of AJV’s I’d definitely recommend going with a pair featuring leather along the upper versus the nubuck for some additional strength and support. They all have great attributes to them but id say overall, itd be between the 2 & 4.
hey nightwing im having trouble choosing from the flywade2 ev or the adizero crazylight 2. im a 7th grade power forward and im a fast runner and cut a lot. i post up also.im kind of scared to get the crazy lights because of the ankle rollover problem. im not sure there going have the same problem. 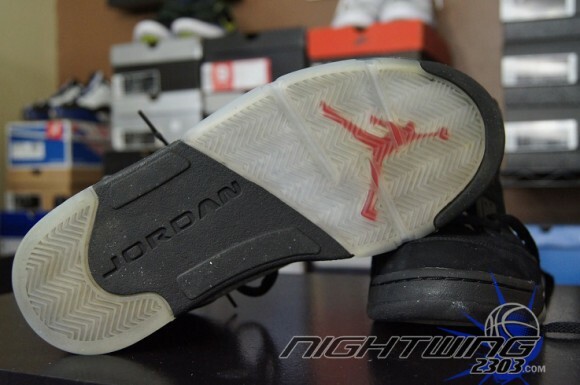 hopefully Jordan brand comes out retros with phylon or even cushlon midsoles to increase comfort and durability. Is it possible to have a different midsole and still have air? I would love if that happened. They could always update the retros like they did w the 8.0. Good review. 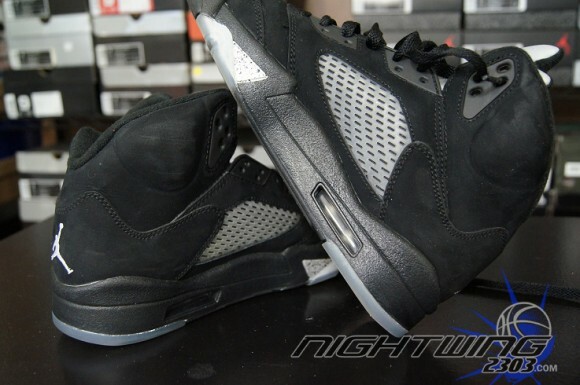 I was hoping to hear better results, because aesthetically this is one of my favorite Jordans. You’re doing yeoman’s work here… I think people will be using this series of reviews for years to come. Thanks. Its possible if you are patient. Im not going to list resell prices though bc when they retro again itll still be between the $160-180 range. Hey on ur first 23 pairs of jays the air Jordan 1 lows how much is it worth now? Trying to sell them and I need to know how much to list it. Thank u. Not sure. I bought them on clearance for $50. another great review. hopefully the cushioning will get better on the next few shoes. hey nightwing im having trouble choosing from the flywade2 ev or the adizero crazylight 2. im a 7th grade power forward and im a fast runner and cut a lot. i post up also.im kind of scared to get the crazy lights because of the ankle rollover problem. what do you recemend?